Yes, I’ve been there. But only twice. Once last winter as a tourist,and once now that I’ve moved to Boston. Since I didn’t live here when it opened, I missed most of the brouhaha. Perhaps I come to it with less baggage. The first time I visited, I put less pressure on the building. I probably thought a little less about how it might function as a museum that I would visit regularly. I wanted an exciting architectural experience — a tourist’s entertainment — something that would communicate to me in broad strokes about museums and cities and art. That first time, I was somewhat disappointed. Anybody who works at a museum knows it’s hard to get people in; the building can help seduce them. But as you approach the ICA through the parking lots — at least until the neighborhood is developed — you’re met with a façade that belongs on an alley. The large glass elevator, which could be a signature for the place, is hard to find and presents little drama. The “mediatheque” is a room of quiet contemplation, a sort of seaman’s chapel. But its view down to the water — no earth or sky, no beginning or end, just “nothingness” — is so forced it makes you miss your freedom to explore. The concept is better than the experience. It’s a straitjacket of a room. I barely remember the galleries from that first visit. They are plain, serviceable enough, but the spaces seem small, particularly for viewing contemporary art. I was gratified that the gift shop seemed almost hidden and that the café was not overdone. I loved the theater, with two glass walls featuring views of the sea and sky that connect performances to the life of the city. And I loved the outside seating, under the cantilever, making nature and Boston the spectacle, open around the clock. So now I am living here. I intend to visit the ICA often. I now need this same building to do more work for me — to work well as a museum. On my first visit as a resident, I was at once more pleased, and more disappointed. Even with its curving contemporary form, the building still feels subdued. The wood that wraps around the building is purposely faded, like pre-washed denim. Nearly all surfaces are muted. Little inside the building sharpens my vision or my senses. Bland artificial light is cast too evenly in the galleries. Outside, the milky glass around the gallery level looks more like Target than like Cartier. But I like the solidity of the place and its lack of arrogant geometries; the calmness of its few materials is handled well. This allows you to see art in a peaceful setting, even if it’s not an exhilarating one. You can visit often and enjoy the ICA without being irritated. It offers polite views of an already polite city. And maybe that’s what makes it a Boston building. To read the views of artist Ross Miller, writer Deborah Wiesgall and architect Gretchen Schneider, click here. Then tell us with whom you agree! As close as you’re ever going to get to this unbuilt building. Nice sound in this video too. Nice to “walk through” this. The openness of it and the use of glass make me think of the auditorium at Boston’s (one year old) Institute of Contemporary Art, by Diller Scofidio + Renfro. In that project, fifty years after Mies, the auditorium is also open to the outside via floor-to-ceiling glass. 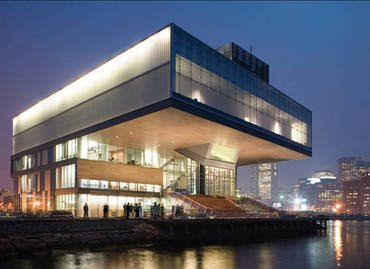 You are currently browsing the archives for the Diller Scofidio + Renfro category.